Okay, so yes, these are all fake. But man, are they good fakes. 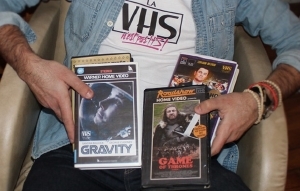 In a project that started as an April fool's joke, an artist posing as a parisian hipster named "Stan,"has been recreating TV shows and movies as VHS tapes. And they look totally authentic. French site golem13 ran an interview with the artist who showed off his wares. Since then, the collection has become the envy of VHS fetishists around the globe. Check out his tapes below.